Lux Superstar 2018, the new edition of the glamorous beauty pageant of the season, was launched at a city hotel on Wednesday. Channel i managing director Faridur Reza Sagar formally inaugurated its launching ceremony on the day. Unilever Bangladesh Limited Head of Personal Care Nafees Anwar and Unilever Bangladesh category head, Skin Cleansing Nadia Tabassum and former winners of the beauty contest were also present during launching ceremony of its new edition. Registration for Lux Superstar presented by Channel I, was announced along with the logo revealing. Keeping pace with time, the registration progress was completely digitised for the first time in the history of this beauty contest. From now on, the contestants can easily register at the newly launched website www.luxsuperstar.com or through Lux Bangladesh’s Facebook page. Speaking on the occasion, Faridur Reza Sagar said that a woman’s essence is made up of both the seen and unseen beauty and this year, The Lux Super Star will search the unseen side of woman’s beauty. 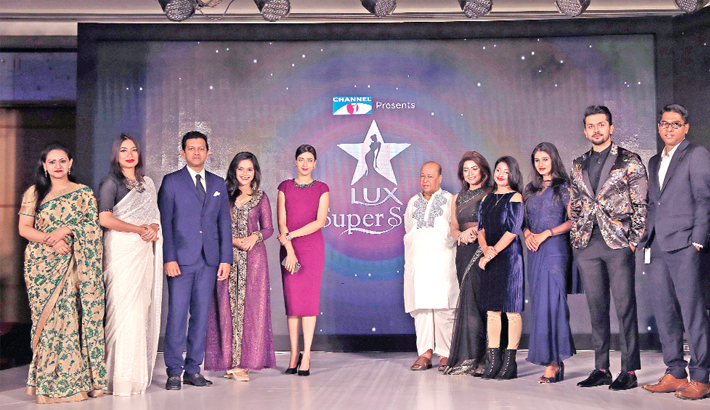 Unilever Bangladesh Limited Head of Personal Care Nafees Anwar said that the former Lux Super Stars are now playing lead role in the show business and related industry. Those who emerge after going through Channel i presents Lux Super Star’s training, grooming and mentoring, would one day attain top positions in the industry. Popular versatile artiste Sadia Islam Mou, singer and actor Tahsan Khan and Arifin Shuvo will be the judges of this edition. The organisers informed that the winner of this year’s edition would get a car and Tk 5 lakh in cash. She would be the brand ambassador of Lux and would get an opportunity to serve at Unilever brand communications. The winner would also get a chance to act in a lead role in a film produced by Impress Telefilm. The 1st runner up would get Tk 4 lakh and the 2nd runner up would get Tk 3 lakh in cash. Apart from these, all top 10 contestants would have a portfolio done by renowned photographers.